This innovative and surprisingly original horror film came from John Krasinski who not only starred but co-wrote and directed it. 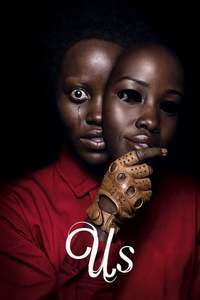 The movie’s central horror conceit is effective but at its core is the story of family shattered by grief and in a desperate struggle to pick up the pieces. Each family member is struggling under the weight of their own guilt and sense of loss. Each struggle to deal with it in their own ways. The craftiness in melding the horror and family elements can’t be praised enough. This was easily one of the most beautiful films of 2018. It comes from French filmmaker Xavier Beauvois and tells a little known yet powerful World War I story. It’s not about the troops but the women left behind to keep their families, their farms, their livelihood together. The film’s slow observant rhythm rewards the patient viewer with a unique perspective on these characters and the uneasy drama that unfolds in the final third. Fine performances throughout and top-notch direction inspired by some of the great French filmmakers of the past. Despite missing some key players from the first film, this worthy follow-up captured most of what made its predecessor so effective. It’s a tense, slow-boiling border thriller that tackles a highly contentious current issue and leaves neither side of it unscathed. Benicio del Toro and Josh Brolin return to wreak havoc among the cartels stepping over any legal/illegal line set in front of them. Some saw the film as a pointless sequel. I saw it as opening up the series to a wealth of interesting possibilities. The awards curcuits have been buzzing over Alfonso Cuarón’s intimate and deeply personal “Roma” and for good reason. Inspired by a key figure from his childhood, Cuarón weaves together one gorgeously crafted visual composition after another. Every frame is crafted with painstaking detail and not an inch of the shot is wasted. 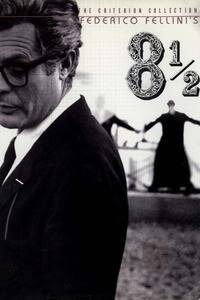 It’s a film that hearkens back to the filmmaking of Fellini, Tati, and even a touch of Bresson. Still, it’s much more than gorgeous eye candy and it definitely feels fresh among the steady stream of modern filmmaking conventions. Paul Schrader’s intense yet sensitive “First Reformed” is unlike anything else I saw in 2018. It’s a film rich in themes – faith, guilt, obsession, self-destruction, and spiritual despair just to name a few. It’s a film wrestling with the idea of “a world without hope” and it does so with the most open and earnest of intentions. And then there is Ethan Hawke, a great actor giving a career best performance. As fascinating as the subject may be, it doesn’t get off the ground without Hawke who is nothing short of superb. 2018 saw Damien Chazelle follow up his award-winning “La La Land” with a biopic of the enigmatic Neil Armstrong. It was bogged down early by undeserved criticism and seemingly overlooked by many throughout its box office run. It’s a stirring portrayal that aims to be more personal than theatrical. It’s an approach I really appreciated. The movie is helped by a widely misunderstood performance from Ryan Gosling who is understated by design and hardly without an emotional underpinning. It makes for a wonderful study of an iconic American figure. Talk about a movie I wish more people would see. Director and co-writer Debra Granik’s subtly piercing father/daughter drama left an impression on me and I have felt its emotional tug since. Granik (who gave us “Winter’s Bone”) once again gets down on the most human of levels and does it through a segment of our population on the fringes. Ben Foster’s performance is powerful in its restraint, but it’s newcomer Thomasin McKenzie who shines brightest. She’s the emotional anchor and it’s impossible to not be moved by her story. I’ve long had reservations about Paul Dano the actor. I have no such reservations when it comes to Paul Dano the director. “Wildlife”, his directorial debut, sees him telling a piercing family story with the delicacy and precision of a seasoned filmmaker. A very good Ed Oxenbould is our eyes. Jake Gyllenhaal is fantastic. But this is really Carey Mulligan’s show. She brilliantly cracks open her character and works a wide range of emotions to give form to her many complexities. It’s one of the year’s best performances from one of the year’s best movies. Whenever the Coen brothers make a movie it automatically has my attention. “Buster Scruggs” shows the siblings flexing their creative freedoms in ways we haven’t seen before. The movie is an anthology – six short stories with very different flavors but each connected with a familiar thematic throughline. While its structure is unconventional, even a bit wacky, it’s unquestionably a Coen brothers film. You’ll find their dense wordplay, beautiful visuals, and quirky sense of humor stamped all over this thing. In a year where independent films shined the brightest for me, it’s a big budget blockbuster that was my easy choice for best of the 2018. “M:I – Fallout” tops my list for a very simple reason – it is easily the most fun I had at the theaters this year. It is exactly what I want from a blockbuster. While the action is exhilarating and the thrills non-stop, writer-director Christopher McQuarrie never shortchanges his story or his characters. For me it sets a high bar not just for the franchise itself but for what blockbusters can and should be. There you have it. Please let me know what you think in the comments section below. What did I get right and where did I go wrong? I would love to hear you thoughts. Lets do it again next year! This is a fantastic list. I have unfortunately not seen First Man or A Quiet Place yet. I am surprised by your recommendation of Sicario 2 and will seek it out based on what you said. 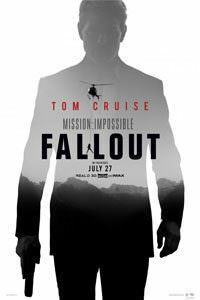 It’s good to see some love for Mission: Impossible- Fallout and The Ballad of Buster Scruggs. Thanks so much. “Sicario 2” is a movie I loved despite some of the criticisms it received (some of which I feel was terribly unfair). “Fallout” was an easy choice for me. I adore it and it’s the only 5 star score I gave all year. Have you seen “Wildlife”? 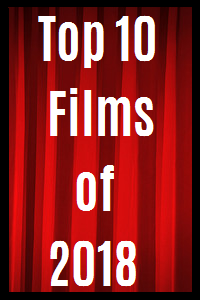 Of the films in your top 10, I’ve only seen 2 of those films in The Ballad of Buster Scruggs and First Man while the only other 2018 film I saw in your list is Annihilation as I will post my “unofficial” list on New Year’s Day. Look forward to seeing it. What did you think of the movie year as a whole. I had so many really good movies that I HATED to leave off my list. For me it was that kind of year. I thought it was alright but I wished I saw more new films but I’ve been saying that for a few years. My viewing this year was weird. I had two gaps where I hardly saw a thing (for one reason or another). And of course there is always the incredibly annoying cases of movies getting big market releases but not opening here until next year sometimes. That drives me nuts. Ha. My quiz I’ve set for tomorrow is far less planned than this ha. Cool thoughts. Hmmm, I’m intrigued. So not a traditional list? Ha. A random old mix. I’ve not seen as many cinema films as last year so some I didn’t want to cover as I didn’t want any spoilers when choosing a photo. And I’ve included what I’ve read is the worst film of the year. HA! No but I think I was fortunate enough to stay clear of movie gnomes last year! Well the new Sherlock Holmes fan has bene panned too so has to be specific haha. I was about to see that but took a hard pass! Sounds like a good move. I do love the character and read all the stories but even I think there needs to be a break from it all. Sad thing is there could be a good movie there. Sounds like they missed by a mile. I was very underwhelmed by this year with some of the movies that got high praise and just didn’t connect with me. The Coen brothers just don’t do it for me and I really wanted to like First Reformed but it lost me. However totally agree with Mission Impossible, amazing movie .A Quiet Place I really liked, Annihilation was excellent. My fav genre is fantasy/comicbook movies was well represented with Avengers and Antman Wasp I really enjoyed but Aquaman won it for me. I had a blast. On the other end, Black Panther was a huge disappointment. I grew up with it being one of my face comics and it fell flat. Watched it a few more times and each time, I like it less. As usual, totally enjoy your reviews and thanks for being fair and thoughtful. Now onto 2019 and what will cinema bring us? Thanks so much for being such a faithful reader. It’s such an encouragement. It’s funny because I found myself liking a lot more movies this year than I expected to. I ended up cutting a lot of films that I thought a lot of. You and I definitely saw eye-to-eye on “Fallout”. It was such a fun ride and a near perfect blockbuster. Did you happen to see “Wildlife” or “Leave No Trace”? Leave No Trace was very good but Wildlife for me was alright but I admit openly, Jake Gyllenhaal isn’t a actor I enjoy for some reason. But I think another movie that was neglected a bit was First Man .Glad to see it so high on your list . Leave No Trace has left such a mark on me. Maybe it’s me being a father with a daughter. But it moved me so much. As for “First Man”, do you think it’s a movie that will be re-evaluated over time and finally get the respect it deserves? I truly do. I do think that First Man will get the love it truly deserves over time . Sometimes a gem like that will rise to the top , while others who get accolades dim over time . Having been 6 years old and engrossed in the NASA moon mission , I recall my parents allowing me to stay up to see the first step live . This movie really had everything for me . Loved it . Same here. What sealed my love for it was my second viewing. I look my son with me and we watched it on IMAX. He loved it too. It’ll take me some time to put my list together but I reckon First Reformed and Buster Scruggs have a good chance of making it. Leave No Trace was excellent to but it might end up being shrugged out as things stand. Very surprised to see MI: Fallout at the top spot. I’m glad you liked Leave No trace. Man that movie cut me deep. As for “Fallout”, I doubt it will top any other list but I found it to be a perfectly executed franchise blockbuster. So many of those things are bloated spectacles that skimp on character and story. “Fallout” blew me away. Have you seen it by chance? I did see it. I’ll just start by saying that I’m not normally an action fan, though. I thought it was overrated. 😦 Although I did enjoy Henry Cavill. I thought they spent a lot of time on his character which paid off. Fine list, Keith. Great to see Sicario: Day of the Soldado in your top 10. Too often overlooked. Couldn’t agree more with your appraisal. Happy New Year. Thanks so much! So you’re a fan of “Sicario” as well? Great to hear. What did you think of the criticisms? I found many of them to be misguided and even unfair in some cases. Yes, a big fan of Sicario. Were on the same boat re: criticisms. I think they missed the point of what was being offered. Oh,yeah! And I want them back for a third installment. A Quiet Place was one of my favourites as was A Star Is Born. And not forgetting Widows. A Quiet Place really stuck with me. Watched it a second time about a month again had the same reaction. Just love it. A Star is Born is one of the many I liked but just missed my list. Any in my Top 10 you disliked? I want to see more movies, I’m so behind. I can understand that. I had to do a lot of cramming. I ending up missing several I really wanted to see. I want to see The Favourite. “The Favourite” was another one that didn’t knock my socks off. Performances are really good though! I’ll have to give it a watch. 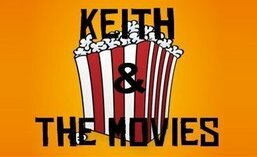 Some great films I’ve seen and have yet to see Keith! I will definitely include First Reformed and A Quiet Place on my twelve favourite film list; First Man will be very close too! Don’t sleep on “Wildlife”. Have you had a chance to see it yet? It’s getting no end of the year attention but I absolutely loved it. Not yet -it got a very limited UK release but I respect Paul Dano and Carey Mulligan’s work; love Jake Gyllenhaal’s acting though so really want to find it soon! No Black Klansman or Sorry to Bother You? I really didn’t go for “Sorry to Bother You” the way most people did. I did like “BlacKKKlansman” more than I usually do Spike Lee films. It’s a fascinating movie but there were a couple of things that held me back a bit. Still really anxious to see it again. I think structurally and totally BlacKKKlansman is muddled toward the end but as a film it really impressed me. I was glued to it. Even with my quibbles it was a bold and gutsy movie. And solid performances from Washington, Driver, and Topher. Nice list! I never make these because I feel so weird knowing there’s a good deal I missed, but I like seeing MI-Fallout #1. Easily the best blockbuster of the year. Honorable Mention: Sorry to Bother You, Black Panther, The Old Man & The Gun, Can You Ever Forgive Me?, First Reformed, Game Night, Destroyer, Love Simon, Upgrade, Halloween. Lots of good stuff there. I really do enjoy doing these things. I love hearing other people’s lists as well. It never fails, I’m always introduced to some movies I missed. As for this past year, did you think it was a good movie year? I had a bunch that I hated to leave off my Top 20. More than last year. Hmmm I think so, but I don’t know if the best and truly hidden gems were reflected on the awards circuit. Overall, I do think that the movies of 2018 are stronger than 2017’s crop. But in a way, I think the individuals performances in totality were stronger last year than this year. I think I agree on both counts. It’s funny how my shortlists for best performances seem a lot shorter than last year. Best Actress is a long list though! Close, Collette, Davis, Fisher, McCarthy, Gaga, Aparicio, Kidman, Stone, Weisz, Theron, Hall, Layne, Mulligan. All great or believed to be. Some of those are more realistic shots than others, but, they were all deserving of praise. But on most best performances list, I too was a little surprised as how there weren’t many resounding stick out performances. I think what has surprised me the most is the wealth of great young newcomers. I think of movies like Lean on Pete, Leave No Trace, Custody, Eighth Grade, Wildlife, and several others. Love this list. My favorite non-horror film this year was FALLOUT as well. That franchise has set the bar impossibly high. Oh man that’s cool to hear. I’m not seeing it on many other lists. It ended up being my only 5 star review of the year. So is A Quiet Place and Apostle going to crack yours? Hey Keith! I just finished my top 10 (to go up tomorrow) so I finally can see what others have chosen. I just didn’t want to be swayed one way or the other. Glad we have a couple in common but I haven’t seen A Quiet Place, ROMA and First Reformed (I almost saw this yesterday but wanted something less dark for the end of the year viewing). Didn’t care for First Man? I adored it. I think I just appreciated that it bypasses the temptation to make it into a big flashy popcorn biopic and really dug down into the man himself. But I can see where that may not work for everyone. I’m with you on Gosling for the most part. The guy just doesn’t have a ton of range. Oh, and thanks for the heads-up. Checking yours out now! First Reformed BARELY missed my top 20. What an excellent movie! Great list! I really went for it, especially Hawke’s performance. What did you think of the ending? I know some who liked it right up to that point. I thought it was thought provoking for sure. Definitely one if my favorite movies of the year, probably woulda have been 21 if I went farther with my list. Thought-provoking indeed. I thought the ending finished the film on just the right note. And there was still plenty of room for interpretation. I wanted to include “First Man” but too much shaky cam kept me from seeing it a second time. I also exclude films that I don’t see in a theater, so “Bird Box” and “Paddington 2” got left out. 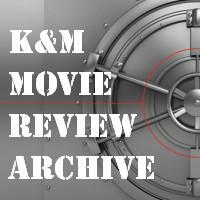 The Mission Impossible franchise may be the most consistently excellent film series of the last 30 years. “Fallout” was terrific. We only had one crossover but I can’t find fault with your choices. Happy New Year. Happy New Year to you too my friend. The Mission: Impossible is kind of incredible. These last three films have gotten better each time. Not sure how they top Fallout. As for the shaky camera in First Man, you aren’t the only one that has struggled with that. I can definitely see it being an issue. For me it added to the intensity of the scene. But my son (who did love the movie) mentioned it being a little disorienting. I think it was an excellent year for independent or arthouse releases, but I was disappointed with the blockbusters, overall, although there are a few biggies from near the end of the year that I’ve yet to see. Anyway – here’s to a good 2019! Hey Sty! ALWAYS great to hear from you! It has been a while. I hope everything is going great and a very Happy New Year to you as well. Ten picks shared out of twenty is really good for these lists. Especially thrilled to hear you mention Leave No Trace. I see that as criminally overlooked movie. What about Wildlife? Have you had the chance to see it? I recently watched it a second time and it cemented it’s spot on my list. What a debut for Dano. I liked several of the blockbusters but (as my list makes pretty obvious) only one blew my socks off. A couple almost made my 11-20, but when considering the wealth of great films they had to contend with…well it wasn’t even close. Ah, I still need to see First Reformed. Major fan of Ethan Hawke. Shame that it hasn’t been released in theatres here. Hopefully some Oscar buzz will change that. Excellent list of movies there anyway; MI: Fallout was a genuinely solid instalment. And you already know that I loved Buster Scruggs! Oh I get so frustrated at how often ‘limited releases’ will skip by my area. Over the years I’ve missed out on some big award winners in the theaters simply because of that. Hopefully you can see First Reformed soon. Hawke will blow you away. Did you happen to see Wildlife? It’s a film that has flown under a ton of radars. It is so, so, so good! Unfortunately I haven’t had the chance, but I’ve heard many good things about it. And Zoe Kazan is an amazing writer! This really opened me up to her writing. Such a fantastic and deeply human perspective. And I think Carey Mulligan will blow you away. Sooo good! I am going to use your list to help me catch up! As I haven’t seen 8 of the films, I think some of it is due to UK release. First Reform had the smallest release ever! I didn’t get a chance to make it to my closest independent cinema for that one. Not to get on a soapbox but release schedules drive me nuts! It can be so frustrating. For instance weren’t Three Billboards and Shape of Water 2019 releases in the UK? It does my head in! They were Jan then Feb releases 2018. I used to wait until March time to do my lists but a few years ago decided to just do my year list as no one was really bothered to read them by then. I wish I could do the London Film Festival as they get all of the great films which usually go to to the awards in October! Ugh! And I’m sure they have some insider reasoning for all of that stuff but it drives me nuts! Boy oh boy was M:I-Fallout a surprise treat! I also really enjoyed it. One of my Top 3 experiences at the theater for sure. It was absolutely exhilarating. Your list made me realize that I’m further behind than I thought I was! Like Caz said above, I should use your Top 10 as my starting point. Ha. Each year seems to bring more and more films. Did you see Blindspotting by any chance? I heard some good things, but totally missed it in theaters. I think it was another limited release that swiftly vanished (or never arrived) in my area. 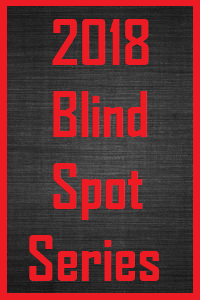 I did see Blindspotting. It’s one of several that I’m up in the air on. Really liked a lot about it but felt I missed out on what others seemed to love about it. Really need to see it again. Do you have a good independent movie theater near you? There is one about 60 Miles (one way) from me. But even they can’t get all of the buzz-worthy indies. Bad disc??? Oh that stinks. What about Wildlife and Leave No Trace? They’re two movies I really hope more people will check out. The only 2018 film I’ve seen is Skyscraper, which is among my all-time favourites. Paddington 2 released in 2018 over here. Same with Lost City in 2017. I always go by when they release here in the States. I really do dislike release schedules though. I wish everyone could get them at the same time. I’ll give you another example. I saw a lot of my UK friends have “Three Billboards” and “The Shape of Water” on their 2018 lists. That’s when it finally opened there but it was a 2017 here. I enjoyed Skyscraper quite a bit. So it sounds like you missed Johnson’s other 2018 movie Rampage? Yep, I haven’t seen it. That’s good. Skyscraper is MUCH better. I was surprised at how much Skyscraper stuck with me. Hoping to watch again with my family. Inspired number one pick. Fallout is god-level filmmaking. Even though I have Fallout on bluray I still can’t get enough of it! I love it. “Fallout” has been my #1 since I walked out of the theater. I did watch it again before doing this year’s list just to see if my enthusiasm was justified. It was! Are there any others in my Top 10 that you’re high on? I’m obsessing over Roma the way everyone’s stanning Bird Box, though I wouldn’t try to start any kind of Roma-challenge, or memes. First Reformed and First Man were also particularly absorbing. 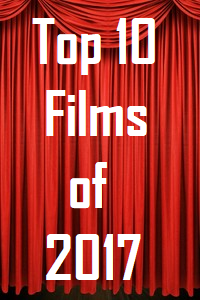 They didn’t quite crack my top 10, but only because there were so many great films to choose from. Would’ve made for less of a headache, but “Top 15” just doesn’t have the same ring to it. I can honestly say if it wasn’t for that parenting angle and its stirring look at grief and guilt I wouldn’t be as high on “A Quiet Place”. But man I really fell for it. Roma is pretty incredible and unlike anything else I saw in 2018. Do you think it has enough umph to grab Best Picture? I kinda do. I saw 1 film from your Top 10 and 2 from your 11 to 20 so can’t say I have much opinion on this. Annihilation was more of a disappointment for myself. As for The Guilty, I had some issues with it which seems to have faded as I think about it more which is always a good thing. Just caught up with A Quiet Place which would make my Top 10. However, you have given me a huge push to catch up with MI: Fallout in top priority. Probably my blockbuster in the Top 10 would be The Meg as well as Netflix Original All the Boys that I’ve Loved Before. Searching would make it also. Other films would be indie films not yet widely released like Pledge, Tigers Are Not Afraid, Firecrackers, Sticks and Stones that I saw on the festival circuit. And I’m not sure whether these are out yet but Burning, Ash is Purest White would as well. If it was more relatable to the general audience, Donnie Yen’s latest film Big Brother would have made it but its more for a Hong Kong audience. Glad you loved A Quiet Place too. I’m telling you, that thing stuck with me mainly as a father of a son and a daughter. The whole family element was great. I hated to leave off Searching. SOOO good. As for M:I – Fallout, it is exactly what I want every blockbuster to be. Breathtaking action but a compelling story and characters I love. Are you familiar with Wildlife and Leave No Trace? Both are small films that (sadly) won’t get the Awards attention they deserve. But sooo good. Awesome. Leave No Trace absolutely crushed me. Wildlife has easily one of the very best performances of the year from Carey Mulligan. Also 2018 seemed to be full of young breakout performances. Both of these films feature one. What are your thoughts on Widows? I think it’s a pretty good one. Would love to hear your feedback! I do like Widows. It was among the several that fell just outside of my Top 20. I’ve felt it’s one I really need to revisit. Sadly I wasn’t able to get back to the theater. What a great cast though, right? It is a great cast! Viola Davis is the best. I really liked it. Was feeling in the beginning it was too boring, but turned out a great surprise with a very unpredictable ending. Viola Davis is a tremendous actress. Did you see her in “Fences”? What a beautiful and powerful performance. She’s going to blow you away with “Fences”. The movie was high up in my Top 10 that year and she’s a HUGE reason why. For what it’s worth, I was very pleased to see “Paddington 2” in your Top 20. Oh I love that movie. It’s a testament to how good the year was when Paddington 2 wasn’t even in my Top 10. It’s such a sweet and funny movie. And how about Hugh Grant? What a hilariously good performance. I LOVE Hugh Grant’s performance in Paddington 2. Is he growing as an actor, or was that ability always there? Is it the roles he’s taking now? Good question. I think he has always had a sly sense of humor but this is straight comedy and he kills it. It’s one of my favorite supporting performances of the year. And that end credits dance number! Hilarious! I really glad to hear from someone else who liked Buster Scruggs. I haven’t heard much enthusiasm for it. Wildlife is exceptional. Recently rewatched it and was once again blown away. Not sure if you’re a Carey Mulligan fan but she gives a phenomenal performance. I like Carey Mulligan and think she’s a great actress. I’m also fond of Gyllenhaal, so I think I’ll check Wildlife out. Sound like a promising film. Awesome! It’s another movie that’s getting no Awards season attention at all. That’s really surprising. My only guess is that not enough people have seen it. I heard about it only from bloggers I think. I think it’s still a little under the radar. What a shame.. Woo! We have three of the same films (Roma, A Quiet Place and First Reformed) in our top 10 😀 Such a splendid year for film isn’t it. I love how you went for Mission Impossible as your number 1, seems like a passion vote but not without reason. Mission Impossible was definitely thrilling and groundbreaking in its own right. 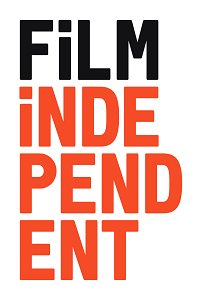 I am intrigued by Wildlife, Leave no trace and The Guardians which I haven’t heard of…haha I always love these indie gems. Great list Keith! 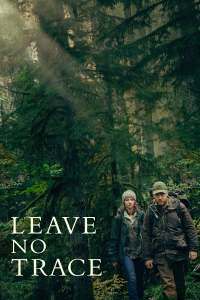 Oh you must see Leave No Trace and Wildlife. Talk about two brilliant films. Leave No Trace is such a quiet yet heartbreaking story. Wildlife is Pail Dano’s directorial debut and I’m stunned it hasn’t earned more Awards attention. As for Mission: Impossible, I genuinely feel it is a perfect blockbuster. Thrills galore but a strong immersive story and it never shortchanges its characters. It also reminds us that sometimes traditional effects and stunt work beats anything a computer can generate. And this is the film that thoroughly convinced me that Stunt work deserves an Oscar category. I agree with BAD TIMES AT THE EL ROYALE, A QUIET PLACE, ROMA and MISSION IMPOSSIBLE 6. I liked APOSTLE, YOU WERE NEVER REALLY HERE, FIRST MAN, LEAVE NO TRACE and THE BALLAD OF BUSTER SCRUGGS, but I didn’t love them. I didn’t like SICARIO 2. Thanks for reading. I agree. A Quiet Place is definitely better than Bird Box. I did enjoy Bird Box fairly well. Were you a fan of it? Happy to see praise for Fallout and First Reformed which I also have in my top 15. I quite liked Custody. the ending was powerful though I think the story lost its subtlety in the last act, when compared to the opening scene. Interesting you include a film (The Guardians) which I’ve not heard of, demands further investigation. I absolutely love Fallout. It’s the perfect blockbuster IMO. The Guardians is such a beautiful film. I rewatched it recently and it held up wonderfully. Hope you get a chance to check it out. Have you seen Mile 22 starring Mark Wahlberg? It was one of the better films of 2018 in my opinion! Most certainly worth the watch. Great list also! Thanks for checking it out. I did see Mile 22 but I was a little late getting to it.